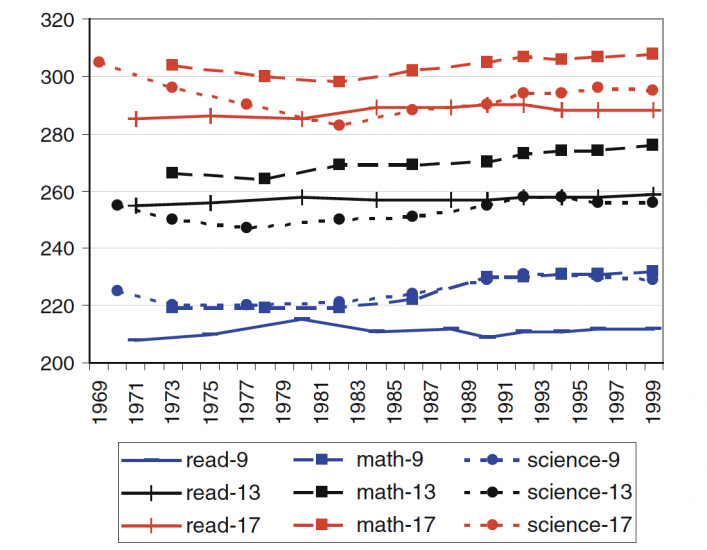 Increases to the quantity of education – as measured for example by mean years of schooling – has, for a long time, been the central focus of policy makers and academic debate. While increasing the access to education is important, the actual goal of providing schooling is to teach skills and transfer knowledge to students in the classroom. This entry focusses on the outcomes of schooling – the quality of education. While we have good empirical data on the access to education we know much less about the quality of education. Unfortunately, the data on the skills and knowledge of students is sparse and has limited spatial and temporal coverage. This is in part due to the difficulty and cost of creating and implementing standardized assessments that can be compared across borders and time. Efforts to measure these outcomes are geographically more restricted (often only OECD countries are included) and even less is known about how the performance of students with respect to these outcomes has changed over time. A third limitation is that measures are sometimes not comparable between countries. The most widely available metric on the outcomes of education is literacy. Data and research on literacy is discussed in detail in our entry on the topic. The Program for International Student Assessment (PISA) assessment, which is coordinated by the OECD, is the most well known international assessment of learning outcomes. The first PISA study was carried out in 1997 and since then it was repeated every three years. The three maps below show the results for the three subjects in which students are assessed. The PIRLS is the other major study carried out by the International Association for the Evaluation of Educational Achievement (IEA). Here the objective is to assess primary school students in reading proficiency. PIRLS only started in 2001. One possible approach to learn from all these overlapping but disparate international and regional tests, is to put them on a consistent scale, and then pool them together across skills to maximize coverage across years and countries. This is exactly what Nadir Altinok, Noam Angrist and Harry Patrinos did in a new working paper: Global Data Set on Education Quality (1965–2015). They collected data from a large set of psychometrically-robust international and regional student achievement tests available since 1965, and they linked them together in a common measurement system. Here we show some key charts using their data. You can read more about their approach and results in our blog post "Global education quality in 4 charts". This chart plots GDP per capita (after adjusting for differences in prices across countries and time), against average student test scores (after homogenizing and pooling international and regional student assessments across education levels and subjects). Each bubble in this chart is a country, where colours represent regions and bubble sizes denote population. As we can see, learning outcomes tend to be much higher in richer countries; but differences across countries are very large, even among countries with similar income per capita. This scatter plot compares national average learning outcomes in 1985 and 2015 (or closest years with available data). This chart shows the share of students who achieve minimum proficiency (i.e. the proportion who pass a global benchmark for minimum skills), against the share who achieve advanced proficiency (i.e. the proportion who pass a global benchmark for advanced skills). To describe the distribution of proficiency within countries PISA segments the achieved outcomes into levels of proficiency. To achieve higher levels, students need to be able to solve tasks of increasing complexity. The results are then reported as the share of the student population that reached each level. The visualization shows the distribution of students proficiency levels in 2009, 2012, and 2015. It is possible to see the data for other countries by choosing the &apos;change country&apos; option below the visualization. Where the top students are better than in other countries, the worst students are less bad than in other countries too. The test scores of the worst and best performing students in each country are correlated as this visualization shows. Countries in which the top students perform better than top students in other countries tend to be the same countries in which the worst students also perform better than the worst students in other countries. In every country and in every year girls achieved higher PISA test scores in reading. The difference of sometimes more than 50 points is substantial as the test scores are standardized to have a standard deviation of 100 points. In mathematics the difference between girls and boys is much more mixed than in the reading dimension. While in most countries boys tend to achieve better test scores there are also many countries and years in which girls performed better than boys. The OECD PISA rankings demonstrate the strength of education in East Asian countries. These results are broadly supported by similar research conducted by the International Association for the Evaluation of Educational Achievement (IEA) and Boston College. The IEA produces assessments of mathematics and science performance (TIMSS) as well as of reading and literacy (PIRLS). Countries that repeatedly rank among the top 5 in mathematics and the sciences are Singapore, South Korea, Hong Kong, Taiwan and Japan. The Latin American Laboratory for Assessment of the Quality of Education (LLECE) assessment: Mathematics score of 6th graders. More information on LLECE is published by the UNESCO here. The OECD also surveys the skills of adults. This is done in the Programme for the International Assessment of Adult Competencies (PIAAC). Here is the world map showing the level of numeracy of adults. More information on PIAAC can be found here. The Programme for the Analysis of Education Systems (PASEC) has assessed educational outcomes in 13 countries in Francophone West Africa. Here is a map of outcomes in French language. SACMEQ reading and math assessments have been carried out in countries in Anglophone East Africa in 1995, 2000, and 2007. Here is a map of the outcome of the assessments of 6th graders on the mathematics scale. EGRA and EGMA are the Early Grade Reading Assessment and Math Assessment which are simple, low-cost assessments of literacy and numeracy. Another interesting aspect of school performance is the effect of family environments and culture on students exam performance. A study by John Jerrim finds that children of East Asian immigrants to Australia outperform their native counterparts in the PISA tests.6 In mathematics, he finds them to be ahead by 100 points representing two and a half years of education. This evidence suggests that the differences highlighted by PISA and the IEA may be driven by cultural or family factors rather than the schooling systems. Indicators of skills and knowledge, such as the OECD PISA scores, are highly correlated with indicators of economic development. The following scatter plot shows the correlation between the PISA reading scores and the United Nations&apos; Human Development Index (HDI) for a select group of countries. There exists a substantial literature on the effects of competition on school quality and performance. Whether choice improves school quality remains an open question in economics. In general we might expect that more schools might be better for outcomes through competitive forces, however this relies on both schools and parents responding to the increased competition/choice. On the demand side, parents need some way of observing school quality accurately as well as the ability to change schools. Meanwhile, schools need some incentive to respond to any increase in competition. This is especially important since most public school systems lack any profit motive. An argument made by Eric Hanushek and Ludger Woessmann is that the lack of any straightforward relationship between resources and school outcomes indicates a minimum resource requirement.10 Once the resource threshold has been reached, additional expenditure has little or no returns to school quality -- instead, teacher quality and other constraints matter far more. The following scatter shows average spending per student from the age of 6 to 15 against reading test scores in 2009. The visualization below shows the correlation between the quality of education, as measured by Hanushek and Woessmann, and the level of prosperity of the country in 2016. Data: Comprehensive data on enrollments, out-of-school children, repetition, completion, gender, teachers, education expenditures, learning outcomes, educational attainment, education equality, literacy, population, labor, and EMIS. This visualization is taken from Hanushek, Eric A., and Ludger Wößmann. "The role of education quality for economic growth." World Bank Policy Research Working Paper 4122 (2007). Available online here. The data shown is originally published by The National Assessment of Educational Progress (NAEP) Source: U.S. Department of Education, Institute of Education Sciences (2008). Jerrim, John. "Why do East Asian children perform so well in PISA? An investigation of Western-born children of East Asian descent." Oxford Review of Education ahead-of-print (2015): 1-24. Rothstein, Jesse M. 2006. "Good Principals or Good Peers? Parental Valuation of School Characteristics, Tiebout Equilibrium, and the Incentive Effects of Competition among Jurisdictions." American Economic Review, 96(4): 1333-1350. Available online here. Bayer, Patrick, and Robert McMillan. Choice and competition in local education markets. No. w11802. National Bureau of Economic Research, 2005. Available online here. Bayer, Patrick, Fernando Ferreira, and Robert McMillan. A unified framework for measuring preferences for schools and neighborhoods. No. w13236. National Bureau of Economic Research, 2007. Available online here. Hoxby, Caroline M. 2000. "Does Competition among Public Schools Benefit Students and Taxpayers?" American Economic Review, 90(5): 1209-1238. Available online here. Rothstein, Jesse. 2007. "Does Competition Among Public Schools Benefit Students and Taxpayers? Comment." American Economic Review, 97(5): 2026-2037. Available online here. Heckman, James J. "Policies to foster human capital." Research in economics 54, no. 1 (2000): 3-56. Available online here. Hanushek, Eric A., and Ludger Wößmann. "The role of education quality for economic growth." World Bank Policy Research Working Paper 4122 (2007). Available online here. 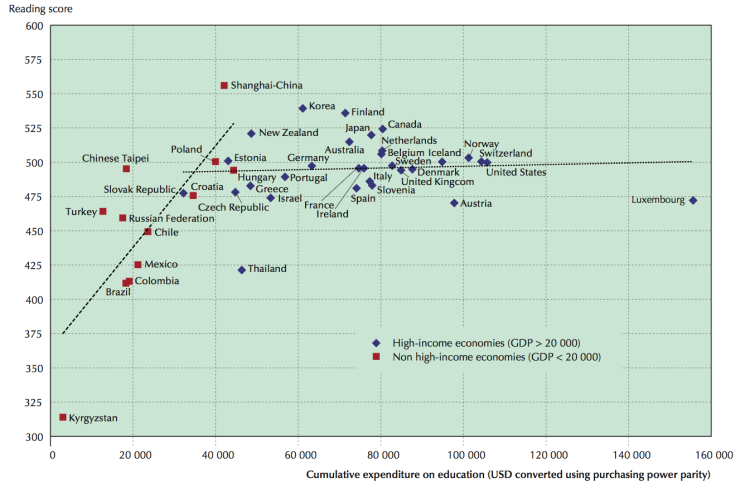 Does money buy strong performance in PISA? - OECD. Available online here.